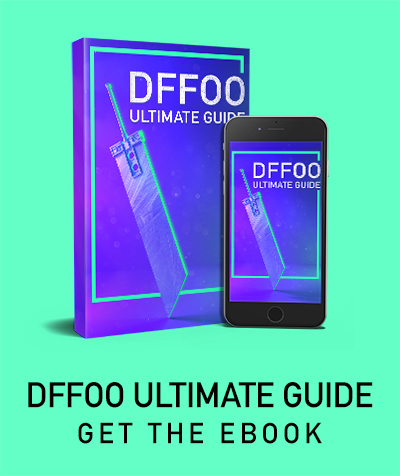 Welcome to the DFFOO guardian summoning guide! In this post, we will go over the information you need to know about the summons. That includes binding, enhancing and knowing when to use them in battles! To equip or switch your summon, head over to the party screen and click on the summon tab. Drag and drop your preferred summon to the bottom left of the party. Before you can use your summon, you will need to bind them first. The Chocobo will already be unlocked after you are done with the tutorial in chapter 1. The rest you will need to unlock via getting their elemental material. I am going to include all the current summons, including the Japanese versions. Chocobo – Deals melee BRV damage to the entire enemy team. Gives the entire team a HP bonus. The good thing about the Chocobo is that it also gives a 10% attack boost during the summon phase. Sylph – Grants wind element to your team, some BRV to the party upon summon. Raises Debuff Evasion Rate by 10% when BRV ≥ Initial BRV. Now she is very useful against enemies that are weak to wind. Both the Zu and the Ferocious Avian will be taking 50% bonus damage during the Sylph summon phase when your characters attack them. Ifrit – Grants fire element to your team, X BRV fire magic damage to all enemies. Also raises Attack by 5% at Max HP, so its useful in campaign missions as your units will deal more damage. Currently very useful and is great against Gaia Behemoth and Chimera as they are both weak against fire. Shiva – Grants ice element to your team, X BRV ice magic damage to all enemies. Also raises Speed by 5% when BRV < Initial BRV. Useful when you run a slow team. Great summon versus enemies that such as the Fire Bomb. Ramuh – Grants thunder element to your team, X BRV thunder magic damage to all enemies. Also raises Defense by 20% when HP < 50%. I think this blessing is situational. Odin – Does X Melee/Physical damage with a low BREAK chance. Also give sword and great sword users 25% increased attack power during the summon phase. Also a situational summon and great if you are running a melee team like Squall, Cloud and Bartz. Leviathan – Grants water element to your team, X BRV water magic damage to all enemies. Also grants 20% Initial BRV Regen for 3 turns when HP < 50%. Alexander – Grants holy element to your team, X BRV holy magic damage to all enemies. Also grants 5% HP Regen for 3 turns when HP < 20%. Brothers – Grants earth element to your team, X BRV earth magic damage to all enemies. Also raises Max BRV by 5% when HP > 80%. Pandemona – Deals X BRV magic damage to all enemies and raises non elemental BRV damage by 50% during summon phase. Grants wind element to your team, X BRV wind magic damage to all enemies. Also raises HP and BRV damage by 5% during a Chain. To upgrade your guardian you will need to get materials by either farming or participating in World of Illusions to farm for higher level materials. Each summon requires different materials. For example, Ifrit requires claws, adamite, core, matter and anima. The good thing is that you can do normal if you team isn’t strong enough to auto hard mode yet. Right now the World of Illusions is offering higher grade materials to level your Ifrit to level 20. I am sure they will host events for the other summons as well soon. Now most of you don’t know that it is best to summon your guardian is on the last character before the enemies turn to maximize the number of turns during the summon phase. Summon skips all enemy’s turns until you get X consecutive turns. After that, it’s depend on whose turn come after your last character’s turn in summon phase. Let’s go with an example. X, Y, Z are your characters and E is the enemy. However, if you use quick actions during the summon in this case, your quick actions can push enemy’s 2nd turn out of summon period. Thus, enemy’s turn will appear right after the summon period end because it isn’t skipped. You get the same number of consecutive turns as the 2nd example, but enemy’s turn can be hardly pushed out of the summon period via quick actions. Bonus Tip: Use a “knock up” skill such as Cloud’s Finishing Touch or Cecil’s Valiant Blow to get more turns. This will allow you to build more BRV to deal more damage!